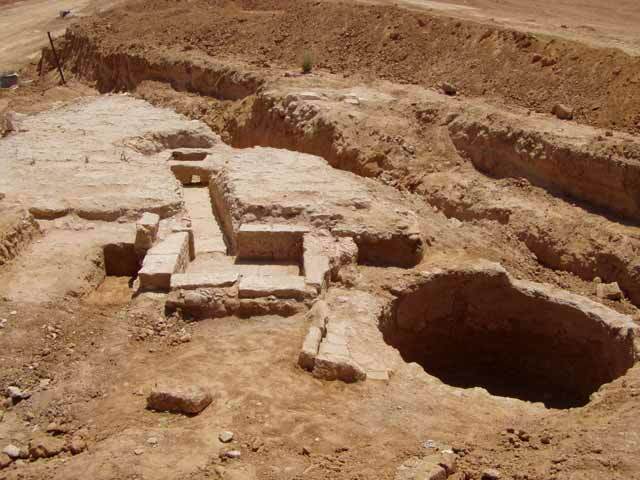 During August 2004, a salvage excavation was conducted in the vicinity of the southern entrance to Be’er Sheva‘ (Permit No. A-4230*; map ref. NIG 18077–80/57115–8; OIG 13077–80/07115–8), prior to infrastructure and development work. The excavation, carried out on behalf of the Antiquities Authority and sponsored by the Israel Lands Administration, was directed by Y. Haimi, with the assistance of A. Hajian (surveying) and C. Hersch (pottery drawing). Two areas (A, B) were opened, revealing a farmstead that dated to the latter part of the Byzantine period and the beginning of the Early Islamic period. In Area A (Fig. 1), a pool used to distribute irrigation water by means of several channels was exposed. The pool was erected in the corner formed by W101 and W103 and was enclosed by W102. Walls 101 and 103 delimited the border of a farm or estate from the end of the Byzantine period. In Area B (Fig. 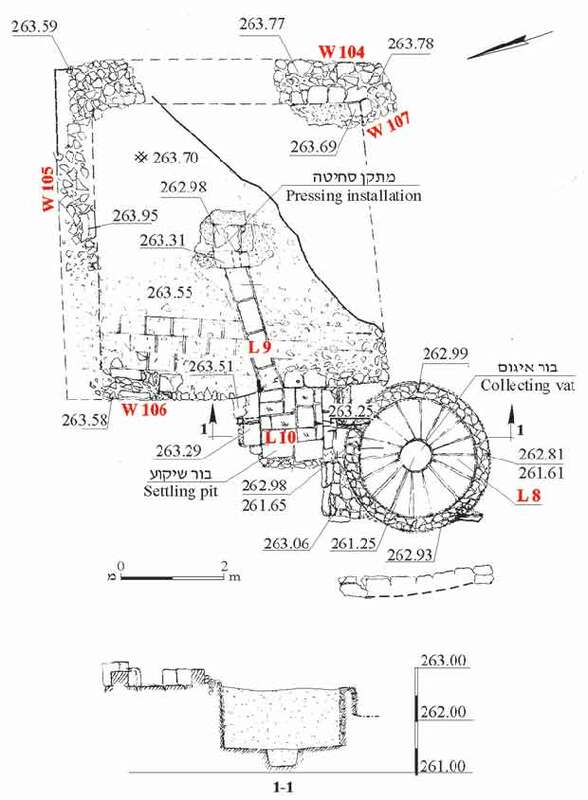 2), a winepress was exposed that consisted of a treading floor, in the middle of which was a pressing installation, a settling pit and a collecting vat that was surrounded by a work surface (Fig. 3). The treading floor (6.80 × 6.90 m) was paved with stone tiles (0.30 × 0.45 m), most of which were removed; their negatives remained imprinted in a bedding of lime-based bonding material and fieldstones. The floor was delineated by ashlar walls, of which only isolated stones survived in the southeastern corner. In the center of the floor were remains of the pressing installation. The anchor used to secure the beam was an ex situ octagonal stone; a collecting vat (Fig. 3; 0.50 × 0.50 m) was exposed below it. 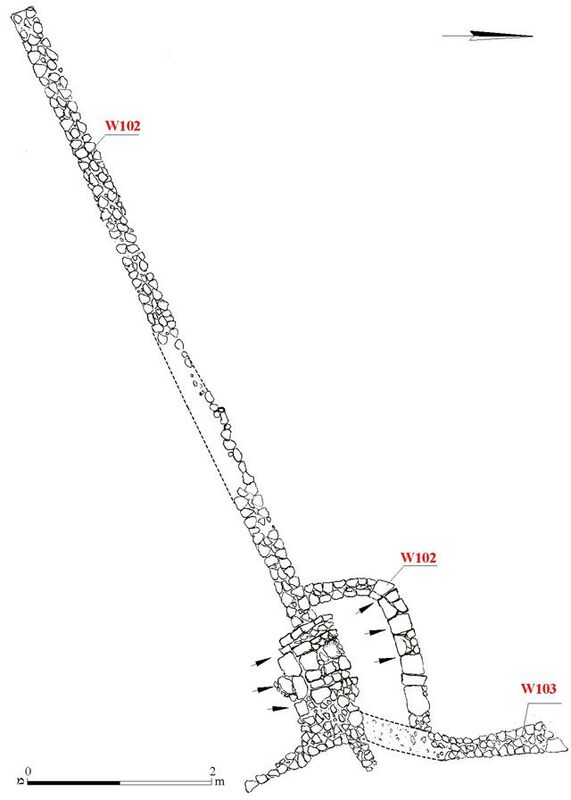 A conduit that was covered and paved with stone slabs and sloped at a gradient of 1% linked the vat to a rectangular settling pit (L10; 1.00 × 1.25 m). The pit's ashlar-built walls were treated with hydraulic plaster and its floor was paved with stone tiles. 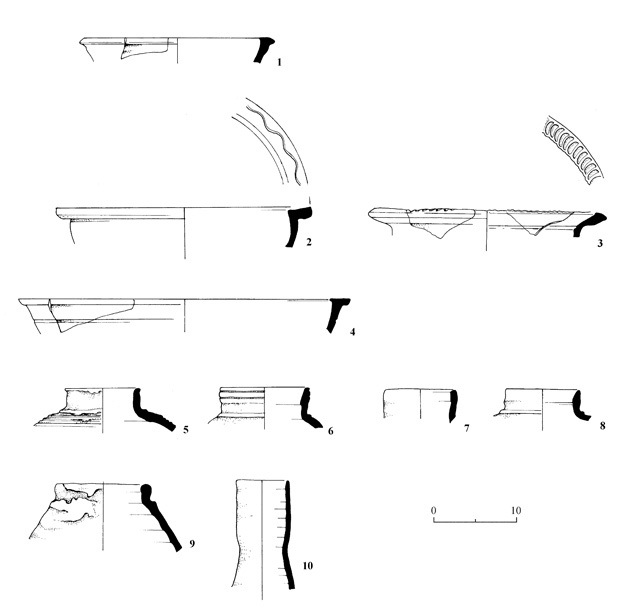 Two openings of ceramic pipes were exposed on either side of the settling pool; one led to a second collecting vat that was blocked, while the other was intended for another collecting vat that was probably never built. The must was conveyed from the settling tank to the round collecting vat (L8; diam. 2.40 m, depth 1.20 m) by means of a ceramic pipe. The walls of the vat were treated with hydraulic plaster and its floor was paved with flagstones. Embedded in the center of the floor was a stone mortar (depth 0.4 m), which was used to collect the sediment. The vat was surrounded by a square work surface, which was paved with flagstones that were partly preserved. The pottery vessels from the installation dated to the latter part of the Byzantine period and the beginning of the Early Islamic period; they included bowls (Fig. 4:1–4), jars (Fig. 4:5–9) and a fragment of a saqiye vessel (Fig. 4:10). The winepress revealed in our excavation, along with one previously exposed in the city (HA-ESI 113:115*–116*), bear witness to a developed wine-making industry in the Be’er Sheva‘ Valley during the sixth and seventh centuries CE. 3. Winepress, general view, looking east.